Insurance does NOT cover the pain from falling . 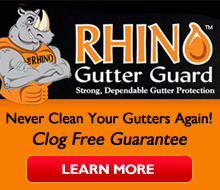 . . Never Clean Your Gutter Again Ever! Guaranteed! For the typical homeowner, climbing a roof and cleaning a gutter system is not fun. Fortunately, micro mesh gutter guards can eliminate the need to clean a gutter manually. In most cases, a guard for gutter is a roll of material that can be installed onto existing gutters. Mesh is a common material that gutter guards are made from. After an inexpensive guard for gutter installation, homeowners don’t have to worry about cleaning debris out of their home’s gutter system. The guard prevents leaves and virtually all other types of debris from entering a home’s gutters. If debris can never enter a gutter system, then there is no chance for the gutters to become clogged. There are several reasons why it’s beneficial to have a gutter guard Madison installed. By having a guard for gutter installed, homeowners can save time that they would have to spend cleaning their home’s gutters. If homeowners cannot clear the blockages that can ruin a gutter system, then they must hire professionals to do the cleaning, which can cost a lot of money. Guards prevent blockages, which saves either time or money. It’s true that guards for gutters do require a small amount of cleaning. However, without a guard, a typical gutter system will need to be cleaned at least two times every year. If a guard on gutter is installed, homeowners NEVER have to clean their gutter system again! No Rust . . . When we install Rhino Guard which is Surgical Stainless Steel. With a Galvanized heavy duty backer. A common problem that gutters suffer from is rust. In most cases, an unprotected gutter will begin to rust prematurely. Wet debris that sit inside of a gutter are what cause rust. The lifespan of a typical gutter system can be doubled by a guard for gutter by Madison. When there is heavy rain in the forecast, it’s almost impossible not to think about gutter problems. A common problem that homeowners face is clogged gutters. When a gutter system is clogged, water overflows out of the gutter and onto the ground. The excess runoff can flood small areas, and it can even damage a home’s foundation. Guards prevent blockages because they stop debris from entering gutters. When rainwater overflows gutters, it can cause staining on a home’s exterior. Since guards on gutters prevent blockages inside gutter systems, the flow of water inside the gutters is improved. Once a guard is installed, water can flow freely through a gutter system, and it can easily flow through downspouts and get to where it needs to go. A guard on gutter also filters out contaminants and debris. These are just a few of the reasons why homeowners choose to have guards for their gutter installed on their home. Cleaning Gutters is a Real pain . . . that Needs to b e Eliminated! Guess what we figured how to do just that! The Reality Of Gutter Guards and the Problems they Prevent! No Replies to "Top Reasons To Install Micro Mesh Gutter Guards"